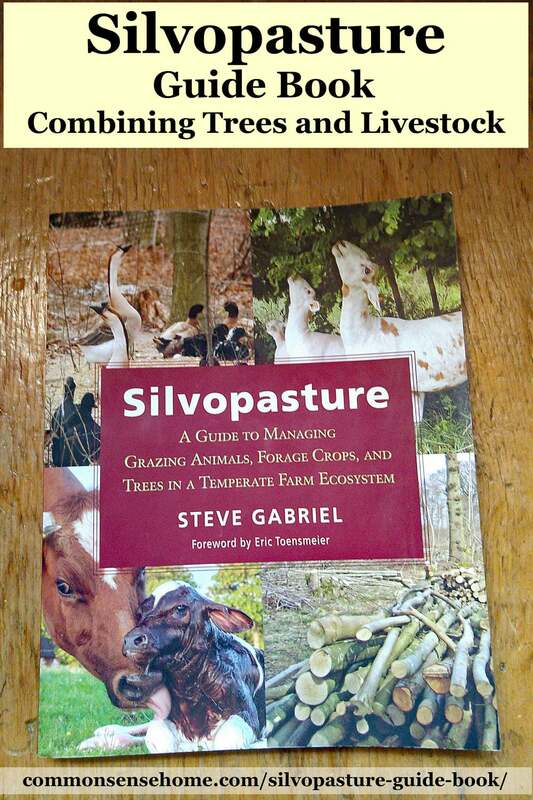 “Silvopasture : A Guide To Managing Grazing Animals, Forage Crops, And Trees In A Temperate Farm Ecosystem” by Steve Gabriel delves into various components of silvopasture and managing grazing animals in a silvopasture system. 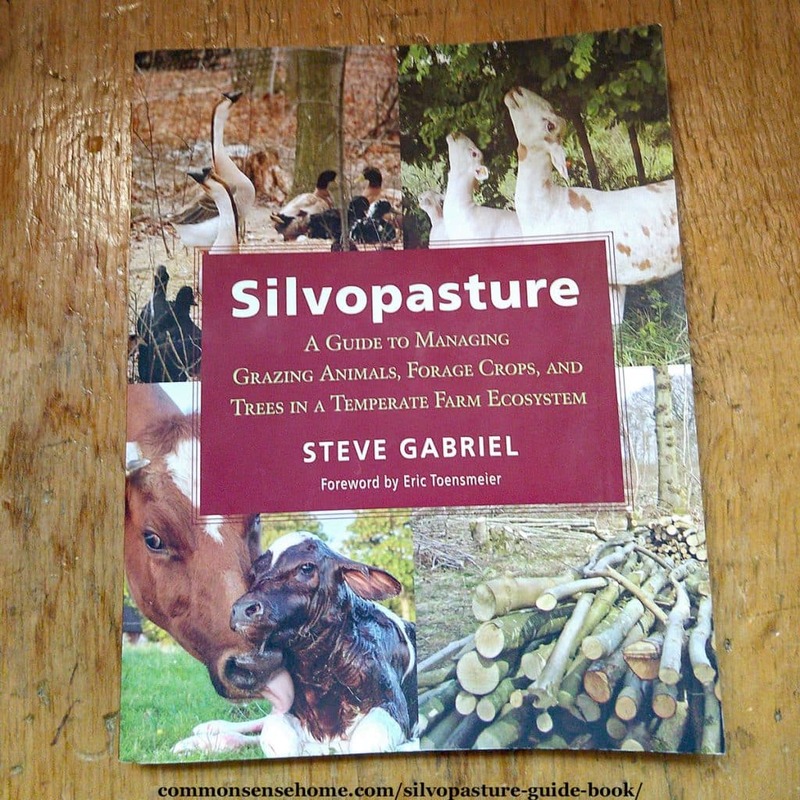 The USDA Forest Service defines silvopasture as, “The deliberate integration of trees and grazing livestock operations on the same land.” Mr. Gabriel answers many questions about managing a silvopasture system, including pros and cons of both tree and animal species. He writes in a straight-forward, easy to understand manner. This silvopasture book features six chapters that each contain subsets of information. A key concept in the book is our role as farmers and growers. We need to see ourselves as caretakers rather than controllers of the environments on our farms or homesteads. We can nurture good habitats, but you can’t fight nature and win. Wind, water and sun go where they will. We need to work with them instead of against them. One thing that surprised me about silvopasture is that animals perform better with access to shade under trees. Grass has higher protein in the shade of a tree, so this is likely part of the puzzle. Another contributing factor may be the animals chewing on the woody browse, ingesting tannins that inhibit parasite growth. I knew animals loved to have trees in their pasture, but I didn’t realize all the benefits trees provide. 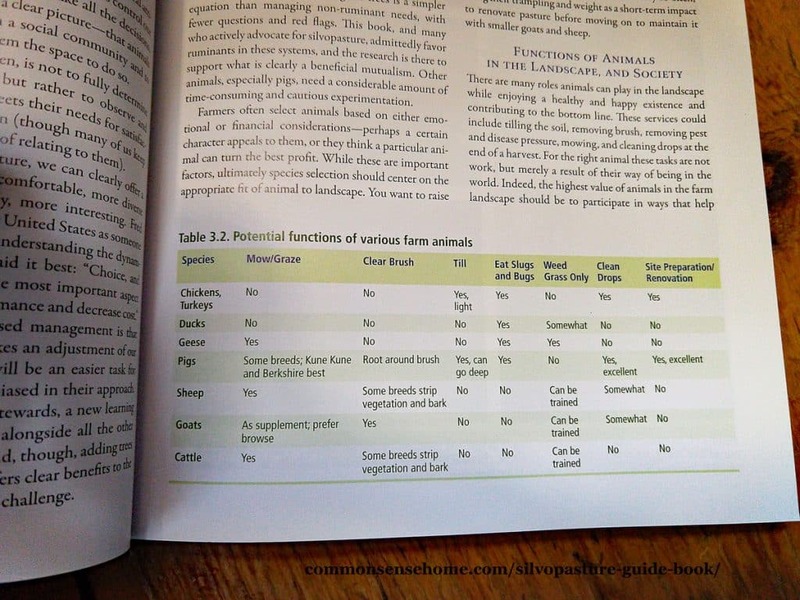 Many times I found myself nodding in agreement in regards to raising animals or other crops. For instance, Mr. Gabriel mentions working with what you’ve got and worrying about making improvements later. He also points out the benefits to starting small and building slowly. Often, we tend to scale up too quickly, or try to improve things all at once. It's cost ineffective, time consuming, and very frustrating. Have a long term plan, but tackle projects one at a time. There are real life stories and information provided by those currently using silvopasture systems. The text also has helpful charts relating to animal and tree species. I was impressed with the information on living barns, hedgerows, and utilizing the environment on your farm as shelter. This doesn't mean using wooded areas as wooded livestock paddocks. Animals rotate through areas, and the plants act as temporary shelters so you don't need to build permanent structures. I do wish that in the tree species section there had been more information about evergreen species being used in a silvopasture, since evergreen trees provide winter protection for livestock. One thing I was especially impressed by was his inclusion of raising pigs in a silvopasture system. Many people say they graze pigs in the woods, but they usually fail to mention the damage pigs do to the trees. Pigs do significant damage to the roots and the entire forest ecosystem if not managed correctly. One should bear that in mind when utilizing pigs on their homestead. Mr. Gabriel explains why you should only allow pigs around trees for two reasons and for short stints of time – during an acorn mast, and in an area you’re trying to clear of brush and or trees. I was surprised that the author didn't mention of the holes that ducks make in the ground due to dabbling, and the damage geese can, and will do, to the lower branches and fruits of orchards. We still have holes in our lawn from allowing the ducks to free range and sometimes we trip or twist ankles in them. After a particularly frustrating year where the geese chewed on all the apples they could reach and stripped off the cherries they could reach, we decided to keep them out of the orchard as much as possible once the fruit burden was drooping the branches. Editors' note: With a small duck flock and regularly moving their water basin, holes are not an issue. The duck patrol at Common Sense Home has not made the yard a hazard by free ranging. They've done an amazing job at reducing slugs and other garden pests. I was disappointed when he mentioned turkeys being useful in the orchard, but then provided no additional information on their management. I’d like to see more information about how, when, and why to utilize turkeys in the orchard. I was irked to find that one of the color photos in the book identified a goat as Boer when it was likely a Kiko goat. It matched neither the body type nor the color of Boers. Maybe the photo was misidentified as a stock photo, or the author didn’t know as much about goat breeds. Hopefully if a second edition comes out this will be corrected. Silvopasture is part art and part science, and requires flexibility and continual adaptions. You combine goals for the current growing season with long term plans for the products produced in your system. Some see silvopasture as a way to restore the land, some see it as a way to have multiple income streams. Others see it as a way to raise animals more closely to the way they were raised long ago. Some may simply participate in silvopasture because they like the challenge. 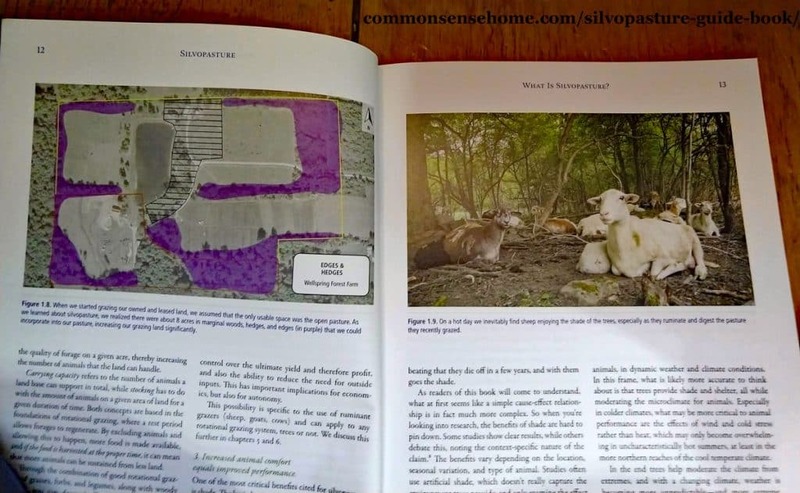 In any case, whether you’re interested in silvopasture or just grazing an area with trees, you’ll want to check out this book. This is a guest post by Dorothy Flaig. A farm girl at heart but an organizer by inclination, Dorothy works to keep things running smoothly for the extended family in their bustling farmhouse. She and her family raise a wide variety of livestock on their Wisconsin homestead, including poultry, rabbits, goats and sheep.